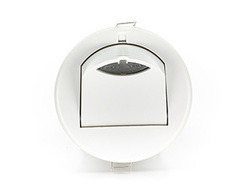 Unlike fixed head microwave presence detectors the MW3SA-KNX offers a unique presence/absence detection capability by using an adjustable head. This incorporates an innovative locking mechanism to prevent tampering. By changing the angle of the head, different detection patterns can be achieved to suit the application. An integral sensitivity adjustment allows the detector to be fine tuned to its environment. The microwave sensor offers high sensitivity to movement. The MW3SA-KNX is self contained and can be flush or surface mounted using a separate detector back box. Configuration of devices on the KNX bus is via the standard ETS software application, allowing all aspects of the presence detector’s behaviour to be configured and controlled. • Range up to 30m at 2.6m mounting height.